Every shop you visit will have some sort of commercial fridge or freezer for drinks and food or in the case of supermarket chains many will have hundreds. Some with glass doors and some open air, also known as multideck, all doing the same thing, keeping food and drink cool and fresh. Refrigeration is responsible for the use of 15-25% of all electricity generated in developed countries. Large supermarkets use around 1.5 Million kWh of energy each year. With this in mind, energy efficiency is crucial. There are 5 key components to a commercial refrigeration unit: evaporator, condenser, compressor, throttle valve and axial fans. 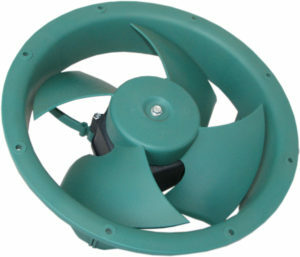 The axial fans work to disperse the cool air created by the refrigerant making the unit more efficient. Being environmentally friendly as well as energy efficient has become increasingly important. The Montreal Protocol, set up to look after the environment, states that all refrigerants will have An Ozone Depletion Level (ODP) below 1800 by 2018. With this in mind companies are constantly looking for new ways to reduce the ODP level of their refrigeration units. CFCs in the HCFC refrigerants are being gradually phased out and more focus is being made on hydrocarbon refrigerants. HC refrigerants however contain an explosion and flammability risk so explosion proof safety is essential, especially considering that many of these refrigeration units will be placed in close quarters to customers. In the rare occasion that a leak occurs in the system this could cause potential harm to those in the vicinity. Products within the system must be suitable for hazardous environments as a precautionary measure. This is where our certified ATEX compact fans come in. As the first of its kind in the market it is a complete innovation. It will not spark due to a short-circuit and can safely control the surface temperature within the range of safety. This will prevent any ignition or explosion. They come in a standard 120x120x38 size and come in 3 speeds. Low (1700rpm), medium (2500rpm) and high (3000rpm). 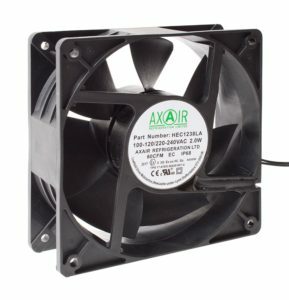 Our Axair ATEX compact refrigeration fan is also IP68. This means that our fans are 100% dust tight and has 100% protection against submersion in water. Not only are our frame fans explosion proof but EC which means they are energy efficient too. EC (electronically commutated) technology is becoming prevalent in the fan industry. EC combines AC and DC voltages, bringing the best of both technologies: the motor runs on a DC voltage, but with a normal AC supply. An EC motor can save the user over 80% energy over its AC counterpart. We are also proud of our exclusive supplier relationship with Wellington. Their innovative range of fanpacks known as ECF’s, part of the ECR range, have been developed with unique technology. ECF fanpacks provide better efficiency than normal fans and baskets. Thanks to their fewer blade design, edge noise is reduced. This, along with the vibration absorbing “living hinges” on the motor mount make for a quieter operation. They have been designed with impact-strengthened polymers and are suitable for both condensers and evaporators. They are also available in high and low power versions using the ECR1 motors. The ECR motors come in 3 types: The ECR82/92, ECR1 and ECR2. The ECR82/92 motors are suitable for use with the majority of axial fans from 150-220mm. Their motors are “mains synchronous”. This means that they can only run at a fixed speed in correlation to the AC mains frequency. The ECR92 (115V) and ECR82 (230V) are the best choice for your application if you want a reliable, low cost, EC motor. The ECR1 is a great solution for both plug-in and remote applications and can be used with most axial fans from 172-254mm. This motor can also be used in long-shaft versions for agitator applications. ECR1 is the motor to choose if power up to 2300rpm is needed. The motor provides a good level of performance flexibility. ECR2 is Wellington’s newest motor. Unparalleled in its ability with low noise and high efficiency whilst also being economically reasonable. Up to 4.5dBa quieter than competing motors and IP67 the ECR2 is designed to handle even the most extreme refrigeration applications. It’s over-temperature foldback capability allows it to maintain airflow even in extreme conditions. In addition, the ECR2 has EMC protection to double the IEC specification. This motor is available for use with axial fans from 125-200, tangential fans up to 300mm and has a universal voltage input of 70-254V 50-60Hz. The ECR2 is also are ATEX approved. For more information on ATEX & EC products in refrigeration please click on the request a quote buttons below, request a call back or contact Axair Refrigeration.